Tom Tobin (1926-1989) was born in Shandon Street, Dungarvan. As a young man he developed a talent for writing and worked at the Dungarvan Observer and Dungarvan Leader. He opened a bookshop in O'Connell Street, Dungarvan and developed an interest in photography. In 1953 he wrote Echoes from the Decies: A Waterford scrapbook. He started the Gazette in 1953 which sold for 3 pence. It had a mixture of local news, historical articles and photographs taken by himself. This issue was a special edition to mark the hosting of An Tóstal in Dungarvan. 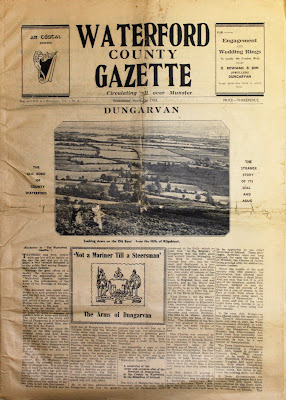 This festival celebrated Irish culture and was aimed at locals and tourists and ran from 1953 to 1958.